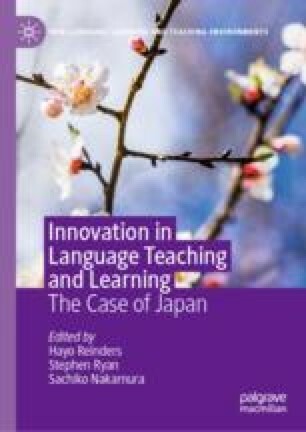 This chapter explores innovative game-based language teaching and learning in three different EFL contexts. In three short case studies, we explore the use of games in mandatory language classes, as part of an extracurricular language and literacy project, and as weekly activity in a language learning self-access center. In each case, we focus on the process of innovating amidst differing contextual constraints and affordances for game-based learning. We also critically evaluate the pedagogical models we developed for using tabletop games in each environment and explore connections to existing pedagogies. We conclude the chapter by suggesting broadly applicable pedagogical implications from our work and insight into factors that created opportunities for innovation in our respective contexts. Central Council for Education. (2012). Qualitative transformation of undergraduate education. Retrieved August 31, 2017 from http://www.mext.go.jp/component/b_menu/shingi/toushin/__icsFiles/afieldfile/2012/10/04/1325048_1.pdf. Filsecker, M., & Bündgens-Kosten, J. (2012). Behaviorism, constructivism, and communities of practice: How pedagogic theories help us understand game-based language learning. In H. Reinders (Ed. ), Digital games in language learning and teaching (pp. 50–69). London, UK: Palgrave Macmillan. http://doi.org/10.1057/9781137005267_4. Gee, J. P., & Hayes, E. (2012). Nurturing afinity spaces and game-based learning. In C. Steinkuehler, K. Squire, & S. Barab (Eds. ), Games, learning, and society: Learning and meaning in the digital age (pp. 129–153). Cambridge: Cambridge University Press. https://doi.org/10.1017/cbo9781139031127.015. Humphries, S., & Burns, A. (2015). In reality it’s almost impossible: CLT-oriented curriculum change. ELT Journal, 69(3), 239–248. Retrieved from http://dx.doi.org/10.1093/elt/ccu081. ICv2. (2015). Six straight growth years in hobby games. Retrieved September 6, 2017 from https://icv2.com/articles/news/view/30959/six-straight-growth-years-hobby-games. ICv2, & Griepp, M. (2017). Hobby games market over $1.4 billion. Retrieved September 6, 2017 from https://icv2.com/articles/news/view/38012/hobby-games-market-over-1-4-billion. Ministry of Economy, Trade and Industry. (2010a). 100 actions to launch Japan’s new growth strategy: Maximize the market’s function through reimagined public-private cooperation. Retrieved from http://www.meti.go.jp/english/aboutmeti/policy/2011policies.pdf. Ministry of Economy, Trade and Industry. (2010b). Develop global human resources through industry-academia-government collaboration. Retrieved from http://www.meti.go.jp/english/press/data/20100423_02.html. Ministry of Education, Culture, Sports, Science, and Technology. (2003). Regarding the establishment of an action plan to cultivate “Japanese with English Abilities.” Retrieved from www.mext.go.jp/english/topics/03072801.htm. Ministry of Education, Culture, Sports, Science, and Technology. (2014). On integrated reforms in high school and university education and university entrance examination aimed at realizing a high school and university articulation system appropriate for a new era. Retrieved from http://www.mext.go.jp/en/news/topics/detail/1372628.htm. SuperData. (2017). Trends and insights on games and interactive media 2017. Retrieved August 22, 2017 from https://www.superdataresearch.com/market-data/market-brief-year-in-review/.